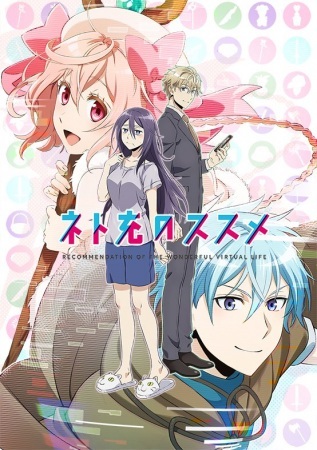 To some degree, one could say that all romantic comedies operate off of our desire to see the couple hit it off, but while some romantic sub-genres (see Harem RomComs, as per my write-up on Nisekoi) work more off of wanting the story to take its “natural pathway,” some shows, such as last season’s Netoju no Susume (or either “Recovery of an MMO Junkie” or “Recommendation of the Wonderful Virtual Life” in English), really do bank on us feeling compersion for the characters, and desiring them to be happy, because our own happiness depends on it (to some degree, don’t get too crazy here). 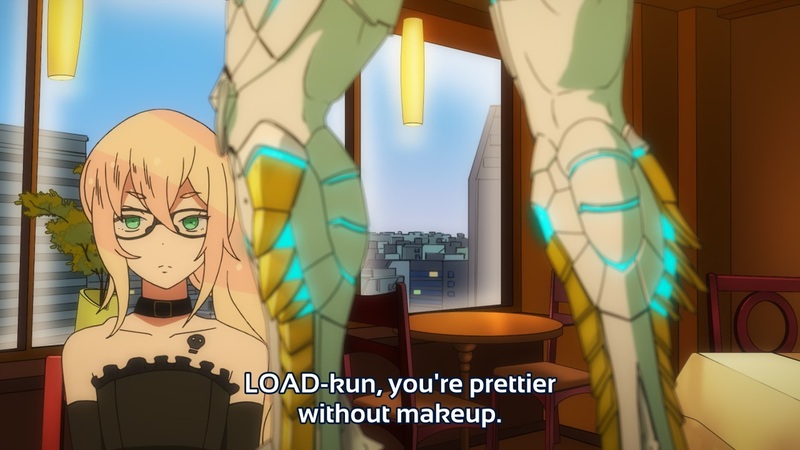 This post is the first Gatchaman Crowds editorial post I’ve written in three years. As such, it also contains the preamble, where I explain why I focus over characters as “masks”, because there are too many things to discuss, and it’s interesting to discuss the many, many ideas of the show through its characters. This post in particular will focus on Hajime and Sugane and how they reflect one another, and showcases Hajime’s role in the show; the second write-up focuses on Joe, Sugane, and how Gatchaman Crowds is part of a discussion and response to its super-sentai origin, dealing with the nature of heroism. Finally, the third archetype discusses Berg Katze not just as a villain, but as a Villain, someone who’s putting on a mask within the show, and who is taking up the villain role for the sake of the heroes. I keep returning to this line. It’s so important within the show. Gatchaman Crowds is not a character-driven show. Though characters are all-important in it, it’s not they who are the vehicle of a story, but its themes are. This is one of those rare theme-driven show, where the main focus is to espouse, sometimes elaborate, and discuss themes. Which it does via its characters. There are many themes and ideas in this show in particular, not for it the narrow focus of other works, not just justice, but gamification, the nature of revolution, internet trolls, bystander effects, and more. You can read my notes on the show from when I first watched it for an exploration of those themes as they’ve come up in the show, and you can also check out my more disorganized notes from the rewatch, which are complementary and break down more things going on. Ah, what a time to be alive, the cour finale for Durarara! !x2 is upon us, and it’d be a bitter-sweet occasion, if not for the fact we have 2 more cours to look forward to, so be joyous and merry, because more Durarara!! is coming soon. This specific write-up began as a post-finale overview for the first of the three cours (To those who don’t know, “cour” in this sense refers to a “Season’s worth of episodes, 3 months’, which is distinct from “Season” for various unimportant reasons) for Durarara! !x2, but as it kept growing longer, I gave in and turned it into an exploration of the themes I found interesting in the show, and how it went about them. In life, stories do not come to an end. There’s never a clean break, and there are always more storylines going on in the background, and things are always, not starting, not ending, but ongoing. 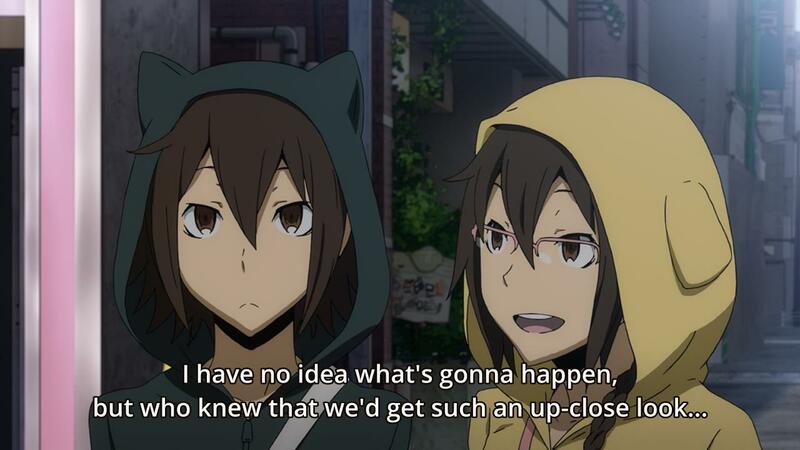 That’s always been what Durarara!! has been about, and especially the first half of the first season. And yet, while thinking ahead to the cour-finale, as I watched it, and especially with all that’s been going on as the episode continued, I was left with the impression that this is doubly true for this cour .